The French Ambassador to Ghana and his wife have hosted a special gastronomic event of a few select guests. The event was a “cooking demonstration and tasting” session with international culinary advisor Chef Clément Nadeau of the recognized French brand ‘Elle et Vire’, specialist of dairy products. Nadeau shared his know-how through four dessert and pastry recipes which delighted the invited guests. ‘Elle et Vire’ originates from Normandy, a region north of Paris; known for its dynamism and at the same time its attachment to the French tradition, in particular for the use of quality dairy products, la crème de la crème! 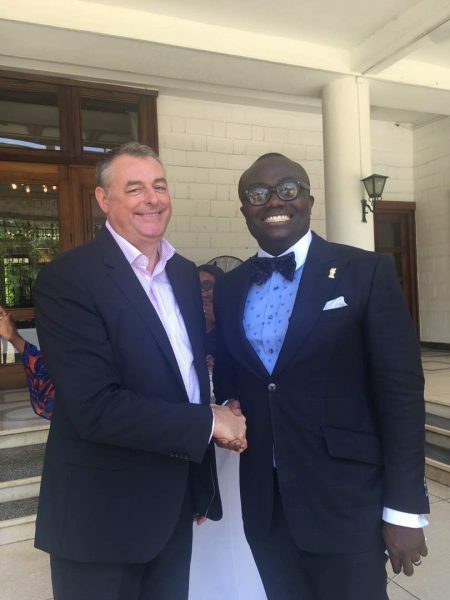 The event was attended by some friends of the Residence including EIB Network CEO Nathan Kwabena Anokye Adisi (Bola Ray) and wife Dorcas Anokye Adisi. Other attendees were the boss of the Koala chain of supermarkets, Manifest, Yvonne Nelson, and two daughters of President Nana Addo Dankwa Akufo-Addo, as well as the wife of the American Ambassador to Ghana.